“Today’s (April 7, 2010 – ed) Gospel of the two disciples on the road to Emmaus (Luke 24:13ff) does more than present a resurrection appearance. It also presents the Mass in seminal form as I will show. In doing this Luke and the Holy Spirit teach us that the Mass is the essential and most vivid way that we encounter Christ now. The two disciples also learn this lesson for as soon as they recognize Christ “in the breaking of the bread” he vanishes from their earthly eyes. In effect Christ teaches them they will no longer see him in an earthly way but now they will see him with the eyes of faith in the Eucharist, the liturgy and, by extension, in all the sacraments. 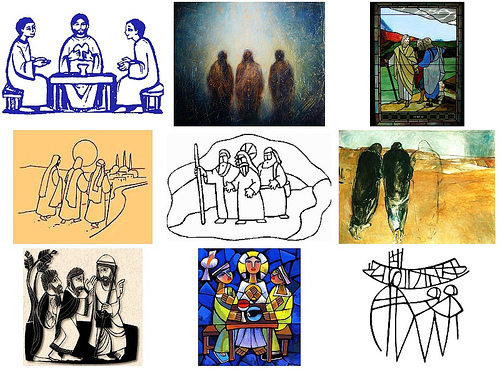 photo credits: Road to Emmaus (top) — http://www.flickr.com/photos/bfish/sets/72157604347560483/; Road to Emmaus set (bottom)– http://www.flickr.com/photos/jiahungli/140699341/. This is one of the few times in my life that words escape me…I experienced a true miracle tonight at Easter Vigil Mass. I don’t even know how to describe it … did anyone else experience it. I am going to stop now and just give thanks. It’s all true. HE IS REAL. In remembrance of our Lord’s sleep in the tomb and in anticipation of his imminent triumph, we will not have an official meeting. I will still be there at the regular time. Depending on the weather, I may pray the Stations of the Cross at the outside stations or pray the Rosary or offer the morning offering of the Divine Office (or, perhaps, the Saturday offering of the Little Office of the Blessed Virgin Mary). Although it would be nice if others joined me, we will not be having a regular meeting. See you on April 23rd. The others were not righteous men. They divorced her publicly, with accusation, taunt, and shame. Each time it was the same: months passed, no child. First came with words – the sarcasm, the ridicule, the hatred. She tried yet harder; tried desperately. When words were not enough and the shame was too great, the beatings began. She knew she deserved them and accepted them. She would try harder. Next came the concubine, next the divorce. Once again, she had failed; she could not give her husband what he wanted. At first, the contempt stung. She yearned to cry out, to tell others that she tried, that she wanted to present her husband with a child. But with each divorce, her shame deepened. She learned how to live with it. They were, after all, right. Her baal needed water. She needed to go and get it; maybe today he will be pleased. Around noon, she goes to get it. In the distance, she sees a man at the well, the well given to her people by their father, Jacob. Curious. Who is this man? She continued to the well; her baal needed water. Looking closely at the man, she notices that he is a Jew. She looks around furtively – fortunately, there were no others. At least he would not speak to her and she would not speak to him – Samaritans did not speak to Jews and Jews did not speak to Samaritans. She was safe. “Will you give me a drink?” Did he really speak to me? What a voice. She had never heard a voice like that. None of her husbands had spoken to her like that. Not even her baal. She noticed her heart beating faster; her cheeks warming; her mouth slightly smiling. NO. NO. NO. She violently told herself that she would not react like that, that she needed to get back to her baal and that he would not be pleased if she tarried. Yet, that voice…. 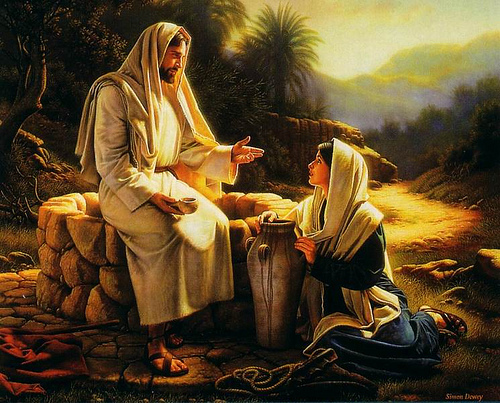 “You are a Jew and I am a Samaritan woman. How can you ask me for a drink?” That should do it. Now, he’ll go away. He shouldn’t have spoken to me in the first place. Let me hurry to get the water for my baal. If I am late, he will be displeased and I so want to please him. She bent to fill her jar. “If you knew the gift of God and who it is that asks you for a drink, you would have asked him and he would have given you living water.” That voice. Who is this man? No, I don’t know who is asking me for a drink. But it almost seems that he knows me. . . .no, that’s impossible. I don’t associate with Jews. How can this be? Let me be logical, practical with him. Then maybe he will go away, maybe my longing will too. “Sir, you have nothing to draw with and the well is deep. Where can you get this living water? Are you greater than our father Jacob, who gave us the well and drank from it himself, as did also his sons and his flocks and herds?” Take that. Only God is greater than our father Jacob. As she said this, she looks closely at his face. There is something about it, about him that she had never run into before. The voice, the face – he knows me but there is something more…something that she didn’t have the word for. “Everyone who drinks this water will be thirsty again, but whoever drinks the water I give him will never thirst. Indeed, the water I give him will become in him a spring of water welling up to eternal life.” Never be thirsty again? Never come to this well, never lug the heavy jar back to my baal? What is it that this man is offering? Who is this man and why is my heart beating fast and why am I smiling? Why does he move me? Thank goodness, this man is a stranger and does not know my shame. ‘Living water’ – whatever that is – is not for me. “Sir, give me this water so that I won’t get thirsty and have to keep coming here to draw water.” There, I said it. What will he say? “Go, call your husband and come back.” Oh, no. He knows or does he? What will he think? What does he see in me? Why did he ask that? What now? Do I lie? No, that is unthinkable, but I can’t tell the truth. Do I leave? Do I back away? What do I do? “I have no husband.” There it’s out. . . please don’t send me away. I want this water, whatever it is; I know you know what I yearn for. You know that I’ve secretly yearned for it. I’ve yearned for it from each of the unrighteous ones, I’ve yearned for it from my baal. I knew it wasn’t for me, but I could never stop wanting it. Not just shelter, affection, dignity. Something greater than these, but includes them, too. I know it’s not water, but whatever it is I want it and I want it from this man. But who is this man? “You are right when you say you have no husband. The fact is, you have had five husbands, and the man you now have is not your husband. What you have just said is quite true.” How does he know? He can’t know. He’s a stranger. He’s a Jew. Yet, he, too knows my shame. He knows. Yet, he isn’t sending me away. All the others do. Most do not let me speak or turn their heads without hearing. Yet, if he said I could stay, I wouldn’t know what to do. I’d be lost, I’d be frightened. What is going on – I’m confused. I must take my time; I will be here tomorrow, but this man may not. He is still speaking to me. He is telling me about my whole life. All the good, all the shame. Everything. He knows how I hoped for a child and the sorrow I felt each time a child did not come and what’s more, in some way I think he felt it too. He knows the deepest longings – the longings of which I have told no one and is telling me that his ‘living water’ is the only way that will fulfill those longings. He tells me of things I have done – things that pleased him in some way. But how can he know? I don’t know, but I know that he does. This man is a true prophet. “Sir, I can see that you are a prophet. Our fathers worshiped on this mountain, but you Jews claim that the place where we must worship is in Jerusalem.” He knows the truth about me, maybe he will tell us that the Jews are wrong about how and where to worship and that we are right. I will do whatever he tells me. “Believe me, woman, a time is coming when you will worship the Father neither on this mountain nor in Jerusalem. You Samaritans worship what you do not know; we worship what we do know, for salvation is from the Jews. Yet a time is coming and has now come when the true worshipers will worship the Father in spirit and truth, for they are the kind of worshipers the Father seeks. God is spirit, and his worshipers must worship in spirit and in truth.” Funny, when he says “salvation is from the Jews,” it doesn’t bother me. This is strange – exciting, frightening, – I hope this prophet will tell me how to worship in Spirit and Truth. I want to worship the Father as he tells me; he is greater than our father, Jacob. “I know that Messiah” (called Christ) is coming. When he comes, he will explain everything to us.” Could he. . .
“I who speak to you am he.” She looked upon him speechless with awe, excitement, and yes, love. It was a feeling she hardly remembered. Who is coming? Another group of Jews. Please let me be alone with the prophet…please… Quizzical looks, murmuring, intimacy broken… leaving the water, she hastens to town to tell the good news that she, she the shamed one, had found the Messiah, called Christ. Once the headaches began, they never went away. After a while, the chills began. Soon she could not get up. Her children and her husband took tender care of her. She never forgot the prophet and what he told her. In an instant, she could summon in her mind’s eye every detail of his face, his voice (oh, that voice – tender and full of compassion), every detail. She could remember when he left never to return. She could remember the stories she heard about a great rabbi teaching in Jerusalem and throughout Judea and how he was killed. She did not know if that great rabbi was the prophet, but she treasured the experience of him in her heart. She knew the time would soon come for her to pass from this earth and she remembered his promise to her: “Believe me, woman, a time is coming when you will worship the Father neither on this mountain nor in Jerusalem.” This – to worship the Father in spirit and in truth forever – had been her deepest longing, a longing that the prophet and his living water would soon fulfill.